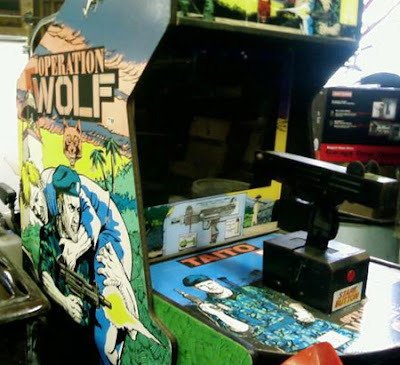 Operation Wolf is one of the most well-known and iconic arcade games of all time. Basically, the game is pretty much a movie conversion of Arnold Schwarzenegger's Commando, only without the funny quips and one-liners. The first thing anyone notices about Operation Wolf is the cabinet, and the rather prominent full-size Uzi sub-machine gun mounted on the front. If there's one thing above all else the game's going to be remembered for, it'll be that. Due to being relatively short in stature, I left it quite late to play the machine, as I wasn't tall enough to play the game comfortably. I'm not a dwarf by any stretch of the imagination, but a comfortable shooting stance just wasn't possible until I was in my teens, due to the fact that the gun wasn't "loose" and on a wire like most other gun games. Fortunately by this time I'd played the game on the Spectrum many many times... thanks to getting the Light Gun version with the computer. OK, so the premise then, is basically exactly what I said... Commando. One man versus an entire army, trying to rescue the hostage(s). It's a side-scrolling shooting gallery, each soldier usually only takes one hit to die, although a couple will lie injured for a second and then leap up and attack again. Most are armed with guns, and will either run on screen or parachute down, or pop up from behind scenery. Some will hurl knives or grenades at you which can be shot away. Or, depending on the scenery, you may have to face tanks, or gunboats. By far the most deadly enemy are the helicopters, whose gunfire certainly has the most detrimental effect on your physical strength. There's other things to be shot, too, windows are always good, but watch out for birds and pigs, they might even drop ammunition for you... for some reason. Alternatively you might just find useful pickups on the floor... such as drinks to replenish your strength, dynamite to act as a "Smart Bomb", or even the "Free ammo" machine gun, which is basically a few seconds of rapid fire without any need to reload. In fact, this is one thing I've always liked about Operation Wolf over other games. Your ammo comes in magazines of around 30 bullets, a surprisingly accurate representation in days of "infinite clips" in both movies and games, but here you will actually have to stop firing whilst you change clip! So it’s worth keeping an eye on how many bullets are in your current clip, and if there’s only a couple, may as well fire those off just to enforce a quick reload. 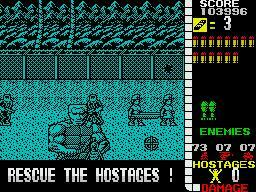 There’s 6 scenes overall (5 in the Spectrum Lightgun version), and they do actually follow on and have their own plot… disrupt the enemy communications to stop them calling for help, get information from the enemy, rest up at the village, get yourself some fresh ammunition, raid the concentration camp and rescue the hostages, then bundle them onto a plane at the airport and escape. Easy, huh? Taito were onto something here, and as usual it’s the little “touches” that make it such a great game. From the off, if you watch the game in “Insert Coin” mode, you see a short intro of Roy Jones (that’s you, by the way) preparing himself by strapping his rocket grenades to himself, sheathing his knife and tying his boots, but then there’s the equivalent of Sonic The Hedgehog’s “SEGAAAAA” moment when the cabinet tells you, “Operation Initiated!” And who can forget the Game Over sequence… the screen fades to white, and you are told in no uncertain terms that you’ve sustained a lethal injury. And then they apologise! The other nice touch is the abundance of endings. Whilst you’re aiming to reach the “Splended! You are a real pro.” message (and yes, they do spell “Splendid” like that. My spell checker is going mad here… wait until I cover the “Eleminated” on Operation Thunderbolt!) and you will eventually see the “Lethal Injury” screen… try dying without any ammo left… or even completing the game with all hostages dead. And then there’s the music. It’s superb, yet very understated. You’re likely to not even notice, especially on the real machine. Luckily, the music made it over to the Spectrum Light Gun version very faithfully. Unfortunately the static graphics (like the Lethal Injury screen) didn’t. Neither did the Jungle Level. But, apart from a little slowdown while firing, the Spectrum version is an excellent translation, and the lightgun worked pretty well too. Whilst I’m sure there were other home conversions that were technically superior, I’m not aware of any other versions supporting a light gun. I could be wrong. But, as unlikely as it is that you’ll find a working arcade cabinet in the wild, don’t worry about settling for the Spectrum version… it’s pretty damn good and just as exciting. Operation Wolf was one of the first games I played on my Speccy, as I got the Magnum Action Pack +2A....It was great being able to play one of my favourite arcade games in my own bedroom, and with an actual gun too! I even learnt to ignore the white flash every time I squeezed the trigger, and actually missed it when I played the non-lightgun release later! Rambo III was also superb on Spectrum. Ian, check out Nam 1975 or something on the Neo Geo.